I dusted off the die-cutting machine, dug into my stash of holiday scrapbook papers and made a batch of Christmas cards to sell at the Art Cottage here in Concord. I also made some cute ornaments to sell too. I'm so happy to be participating in the 99+ Handmade Gift Ideas Holiday Blog Hop, hosted by 365 Days of Crafts. One of my favorite handmade gifts is a painted treasure box. It's the gift and the box all in one! But of course, you still need to tuck at least a little something inside when you give a treasure box, like how grandma always put a dollar inside the wallet she gave you. So I learned something about my friend Linda Peterson - the woman makes magic with bits of old bike tires and soda can tabs! 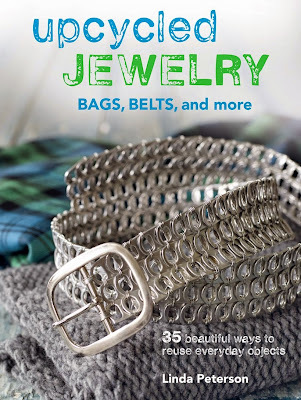 I've always loved her jewelry designs and craft projects, but I really love her new book, Upcycled Jewelry, Bags, Belts and More! It's packed with lots of really inspiring projects that are both eco-friendly and stylish. I have an artisan purse made from crocheted soda can tabs and it gets lots of attention every time I carry it. 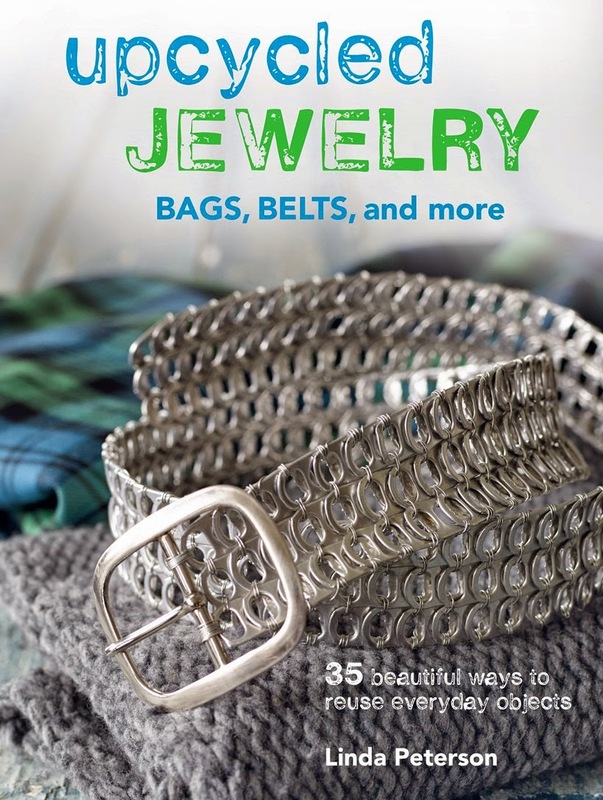 This book shows you how to make your own, plus a matching belt. I love the extreme close-up photos, which make it easy to see exactly what she's doing with each finding or bit of wire. Feeling inspired, I went digging through my recycle bin to make something. The only thing that spoke to me were the mangos. The lower half of these sturdy plastic fruit cups are nicely fluted, so I cut out sections of one cup to make these tiered earrings. 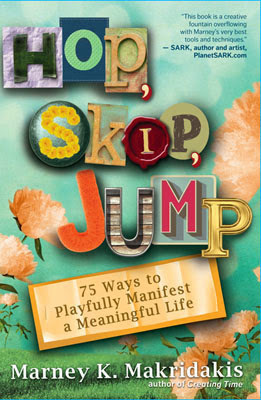 Hop, Skip, Jump is a fun new book from Marney K. Makridakis, founder of Artella Land - an online community for artists, writers and creative entrepreneurs. Marney writes about how to have more fun while you're getting more done. She shares 75 techniques for how to be both playful and productive in order to manifest success. She describes why play matters, that it's about more than being silly or killing time or taking a break. Play is a state of mind; it's about how we stay present and how we magnify what makes us human. When you get tired of your plain glass tumblers, don't buy new ones - just etch 'em with etchall creme. You can use stencils, painters tape, or adhesive silkscreens to add the pattern or image you like in just 15 minutes - love it! A jar of etchall lasts a really long time—you can reuse the creme over and over. Check out their how-to videos and project gallery for more ideas. No matter the weather, always bring your own sunshine! Love this quote, so I incorporated it into a postcard collage - here's how I did it! 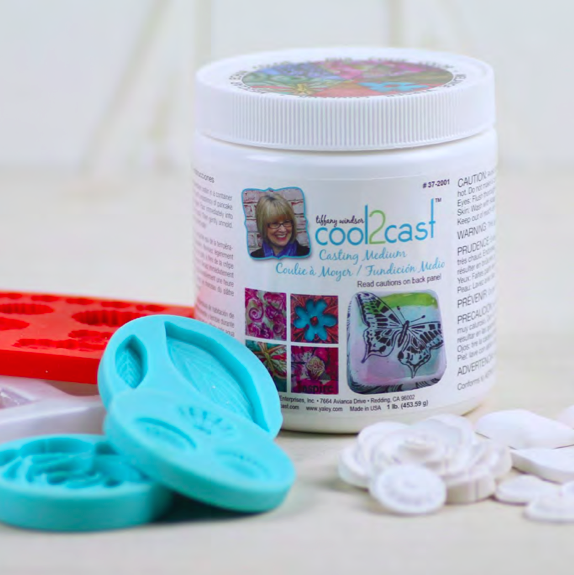 Cool2Cast is a fabulous plaster-type medium for crafts and mixed media - developed by my friend, Tiffany Windsor. You mix it with water and then pour it into just about any kind of flexible mold or container to create fun embellishments. It dries to an opaque white with a really nice and smooth surface for painting, inking or stamping. You can embed things in it, add texture or create resists. This week I'm part of a Handmade Holiday Blog Hop with the Designer Crafts Connection that's sponsored by Fairfield World, makers of Poly-fil fiberfill. The timing is perfect, because I need to make a big batch of ornaments to sell at a holiday art and craft festival at a local gallery. And because I'm all about crafting with my stash, I decided to dig into my supply of yummy wool felt. Here we are, first Monday again (funny how that happens every month or so). That means it's time for a new blog hop with the Designer Crafts Connection - this month our theme is thank you cards and gifts.